Local government workers across England, Northern Ireland and Wales struck for two days alongside civil servants against sub-inflation pay rises. More than 500,000 workers were on strike on July 16 and 17, bringing disruption to schools, town halls, refuse collections and libraries throughout England, Wales and Northern Ireland. 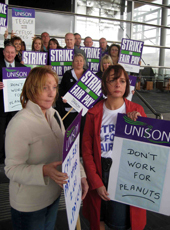 "This has been a fantastic response from our members," said UNISON general secretary Dave Prentis. "Local government workers have shown their anger and resentment towards this pay offer. "The employers must heed the voice of their own workforce and get back round the negotiating table to settle this dispute." South Somerset benefits office: closed. "These members have not taken this action lightly," added Mr Prentis. "But for the fourth year running they are offered a take it or leave it pay cut. They are saying 'enough is enough'. Also on strike were local government workers in Unite and, in Northern Ireland, Nipsa, as well as driving instructors in the PCS. Finally, the employers have now returned to the negotiating table following that two-day strike. These will conclude in September so if there's further action it will be after that point. Many people were talking about trying to strike with teachers next time, but taking into account term time and ballot timetable the NUT won't be striking again until probably November. The PCS are going to have 12 weeks of continued disruption at some point too.